Ball Screw Option now available. The NEW TAIGTURN 2000DSLS System is here. Using the time proven Advanced Digital Sync Lock Servo (DSLS) Technology and a new DISP (Digital Index Signal Processor) the TAIGTURN 2000DSLS can perform high speed Single Point Threading Cycles and other Turning operations with ease. With a Windows XP, 7,8 or 10 Control Interface the TAIGTURN 2000DSLS system can produce high quality parts in prototype or industrial production environments. 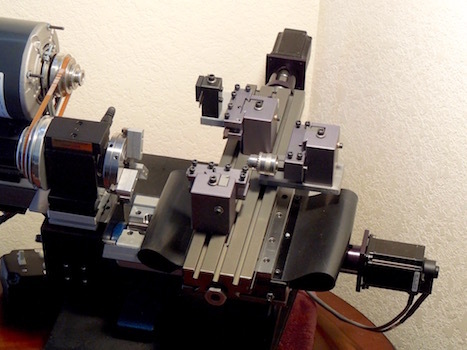 The Closed Loop Servo MicroMill DSLS 3000 System is still here. Utilizing the latest in Advanced Digital Sync Lock Servo (DSLS) Technology the MicroMill DSLS 3000 can perform machining operations much faster and more accurate then ever before. With a New Custom Windows XP Control Interface the MicroMill DSLS 3000 system is easier to use with many more features to offer. MicroProto Systems designs, manufactures and markets precision desktop cnc machining systems for the modern world. Drawing on over 45 years of precision aerospace manufacturing experience we know the characteristics of sound machine design practice.